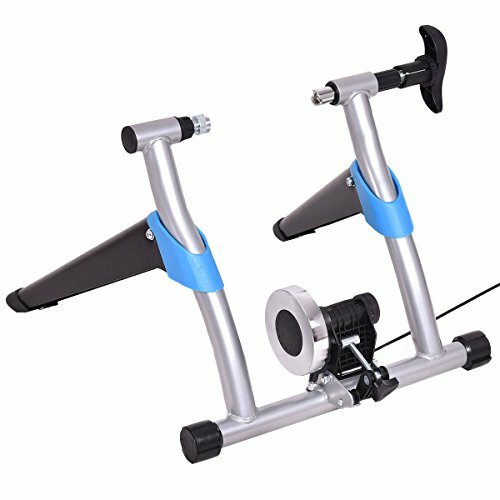 This stand converts your bike into an indoor bike cycling trainer. great alternative to the expensive, large exercise bikes. that locks down on quick release or can be bolted on rear wheels. No need to worry about the weather, you can now bike all year long. The trainer works with road and mountain bikes with 26", 27",28"
for easy storage and travel. Minimal assembly required. Offers effective and convenient indoor training. Easily clamps down on quick release or bolts onto your bike's rear wheels. Heavy duty iron frame construction. New design features separated legs for greater stability. 8 levels of magnetic resistance adjustment. Magnet resistance control wire used for adjust the magnet level. Adjusting the height by the big screws to change the wheel friction. Precision-machined roller to reduce tire wear. Folding design, easy to carry and storage. Fixed device, easy to install and remove. Fits 26-28 inches or 700C bike wheels with quick release. Product Size : 22.4" x 20" x 15.7". Brand new and high quality. Offers effective and convenient indoor training.Easily clamps down on quick release or bolts onto your bike's rear wheels. Heavy duty iron frame construction. New design features separated legs for greater stability. 8 levels of magnetic resistance adjustment. Magnet resistance control wire used for adjust the magnet level. Adjusting the height by the big screws to change the wheel friction. Precision-machined roller to reduce tire wear. Quiet operation. Folding design, easy to carry and storage. Fixed device, easy to install and remove. Fits 26-28 inches or 700C bike wheels with quick release. Material : iron. Fits 26-28 inches or 700C bike wheels with quick release. Product Size : 22.4" x 20" x 15.7". Product Weight : 18lbs. Weight Capacity : 330lbs.